I'd be lying if I said I wasn't completely in love with this outfit. I feel like it's a total win once I find an outfit I'm extremely comfortable in and somehow manage to play it off as put together. This red buffalo plaid top was on my "to buy" list for this year because like the Herrringbone vest, I see so many outfits I want to recreate. 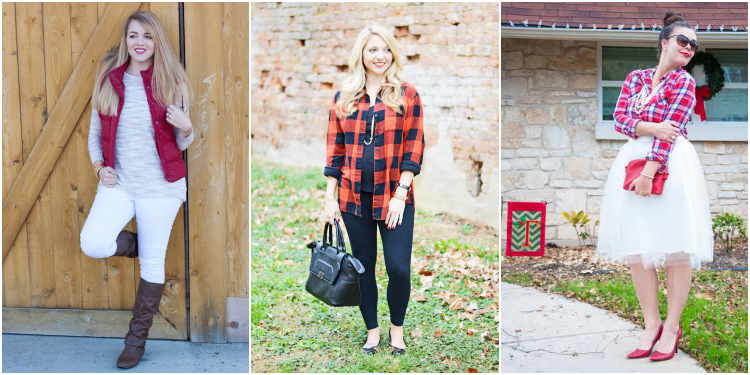 It's an extremely versatile plaid shirt. Because of the black and red with large blocks this shirt comes off as a bit "grunge, rocker" to me. So to tone that down a bit and give it a girlie vibe I added leopard flats and curled my hair. You could easily create the "grunge, rocker" look by adding some buckled boots, a leather jacket and maybe a high-top ponytail. Which direction would you go with this shirt? 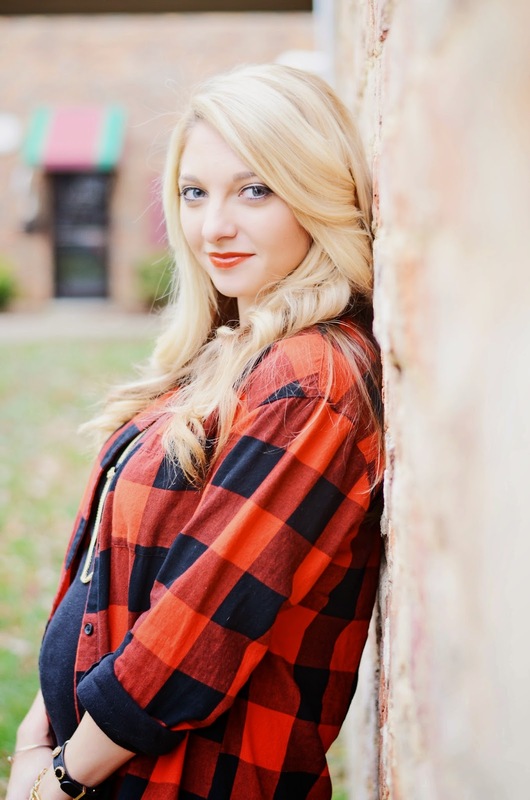 Grunge or girly? Jana already has that pregnancy glow! How gorgeous does she look in red, y'all? I love it when our co-hosts kill it on a theme and Megan from All That Glitters did just that! I really need to add a tulle skirt to my wardrobe! Raise your hand if you have been snowed in already this season. Okay, maybe not snowed in, but maybe you woke up to snow on the ground and all you wanted to do was stay cozy inside? I've got two hands up over here! Show us next Tuesday what you would wear if leaving your house wasn't an option because of all that fluffy goodness floating around outside. 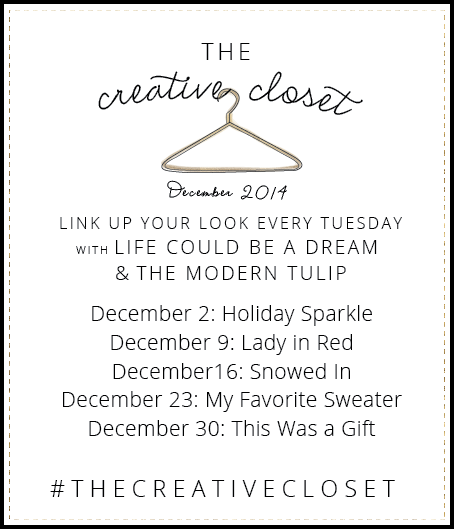 21 comments on "The Creative Closet || Lady In Red"
I love this outfit! Looks awesome with the flats! 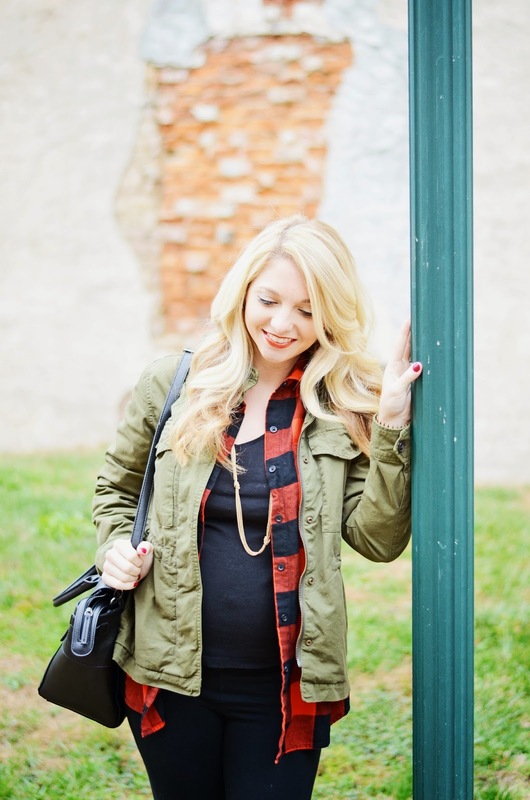 Love the way you put it all together - especially with the olive green jacket! 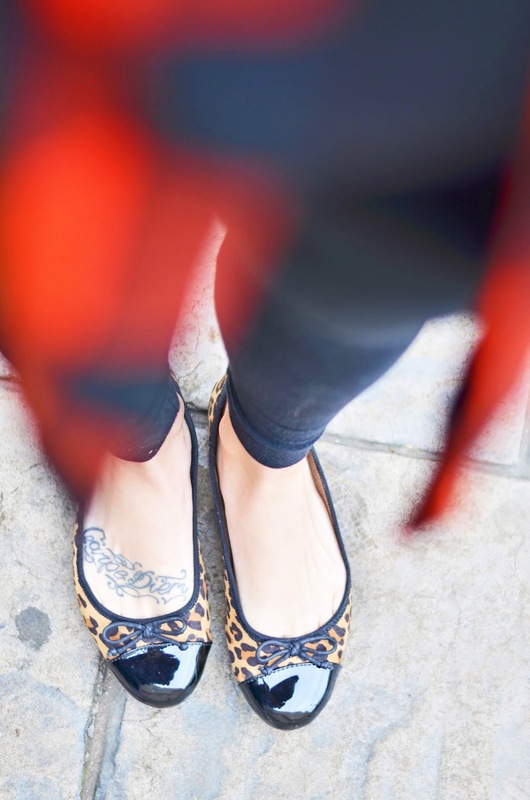 I never would have put plaid and leopard together, but I love it! Looking good little mama! You look beautiful - I'm having major hair and outfit envy. You knocked this out of the park. What a doll! 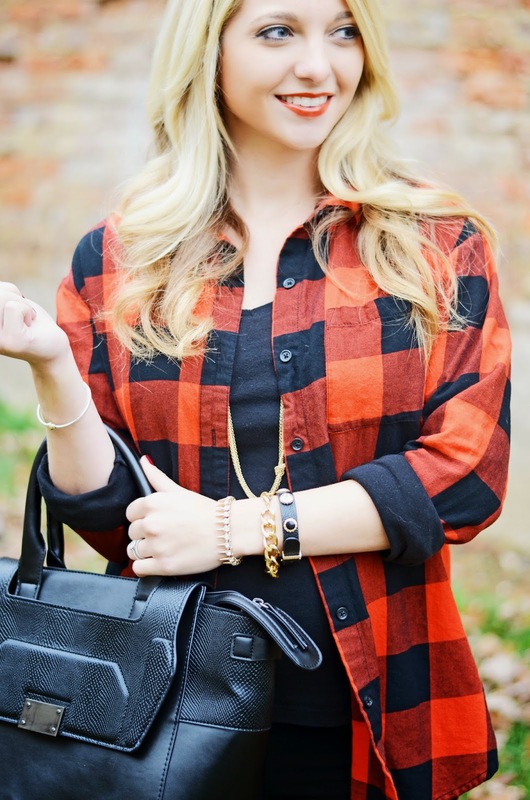 Love that plaid shirt paired with all black! Another AMAZING outfit, you nailed it! You look gorgeous! Love this -- and of course the plaid! You have the cutest baby bump!!!! You are so dang gorgeous. Your bump just kills me–you are the cutest preggo in all the land. :) I love the girlie vibe you added to this outfit–I definitely would have gone the same direction. Grunge is not my thing at all. Your outfit is amazing as always, but can we talk about your hair?! So beautiful. I just love everything about this whole look. I have a bit of an obsession with plaid... So of course I love your outfit! 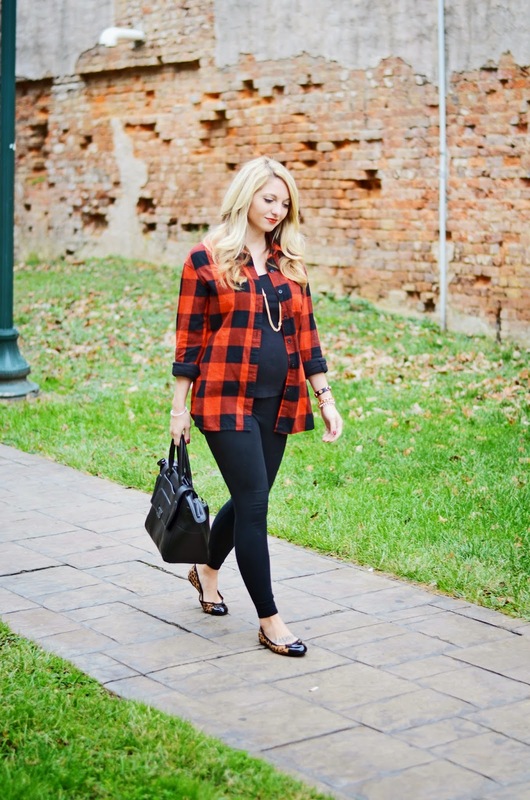 I have really been wanting to add a black and red plaid shirt to my wordrobe. I guess that will be on my to do list! lol. I love the belly button peeking out too! I love that you made this something girly too! LOVE how you took this the girly route! And rocked that open flannel :) SO cute!